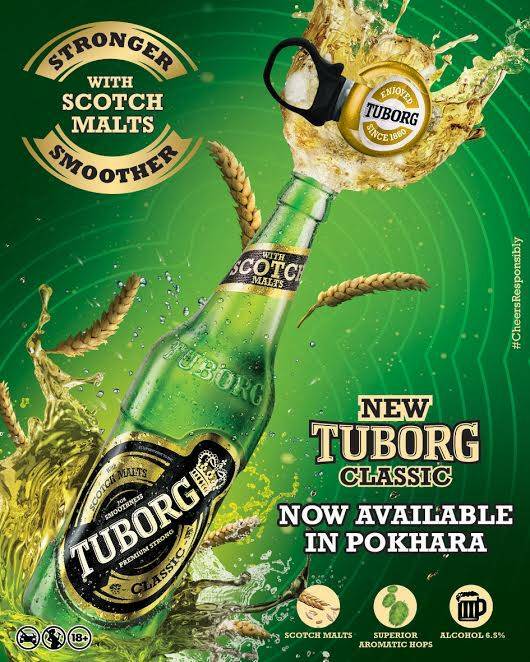 Pokhara - Understanding the consumer needs to constantly innovate to make Tuborg the most liked brand, Gorkha Brewery has introduced ‘Tuborg Classic’- Nepal's first premium strong beer with Scotch Maltsamidst a gala event held at Mount Kailash Resort Lake Side, Pokhara . The event was attended by partners, dealers, wholesalers, retailers of Gorkha Brewery, members of the media fraternity and celebrities alike. Tuborg was introduced in Nepal by Gorkha Brewery (P) Ltd in 1990 and is the first international brand to be launched here. Tuborg is the largest selling and No. 1 beer brand in Nepal and has been enjoyed since 1880 worldwide for its exceptional quality and refreshing taste. As the largest brewer in Nepal, Gorkha Brewery is highly optimistic and confident about keeping up the momentum to be innovative which is expected to be a growth driver in the market. The launch of Tuborg Classic, Nepal’s first premium strong beer with Scotch Malts is an example of that. Tuborg Classic's tagline- Stronger & Smoother- with its rich personality, offers a refreshing drinking experience to the beer connoisseurs with imported Scotch Malts for a stronger & smoother taste.Superior quality imported scotch malts give the beer a well-rounded taste making the drinking experience easy and smooth. The company has indicated that a 650ml botte of Tuborg Classic with Scotch Malts which has 6.5% alcohol content is priced at Rs 310.